Of special interest to this work is the new legislation, The Finnmark Act, that in 2006 replaced the state ownership of resources in the county of Finnmark, the northernmost county of Norway. With the act, ‘the Sami have collectively and individually acquired rights to land in Finnmark’. The act has come as a result of a long fight for Sami rights to own land and culture. People in the county were now able to celebrate freedom from the ‘colonizers’ in the South. Some argue that the legislation in fact opens up for privatization and the market. This is especially true for the political left that traditionally has supported the Sami fight for rights over the past decades. With this issue as a starting point, Holm made the film, The right to the land and the water — an embodiment of societal and economic conditions. The protagonist is a man who is out logging. His mind turns to the relationship between the use of nature, natural resources and ownership of land and water, in diverging and sometimes paradoxical thoughts. Evoking complexities of indigenousness and labor, the narrative is a crosscutting of interviews with people who are affected by and have opinions about the act; managers, lawyers, politicians, historians, activists, artists and other users of the land and the water. 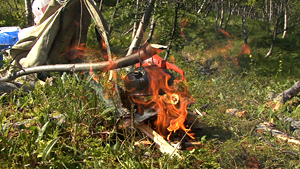 The interviews took place in the counties Finnmark and Troms (North of Norway) in 2009, as part of the Sami Art Festival 2008-2011. Geir Tore Holm lives and works in Skiptvet (Norway). 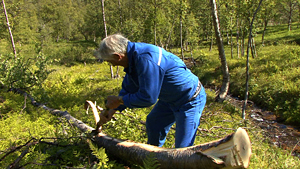 He has been interested in social relations and power structures, often related to his Sami background; first discussing individual identity, connecting to a larger cosmos, then addressing difficulties in ethnic representations. From 2003 developing the long-term dialogue and ecology project Sørfinnset skole/ the nord land with his partner Søssa Jørgensen in collaboration with Kamin Lertchaiprasert and Rirkrit Tiravanija from Thailand. In 2006 he was engaged as Project Manager for developing the Tromsø Academy Of Fine Art, where he used to be a Visiting Professor. He is now a Research Fellow at the Oslo National Academy for the Arts.